How do you get a Nutmegger to try something they’ve pretty much been against throughout its construction? 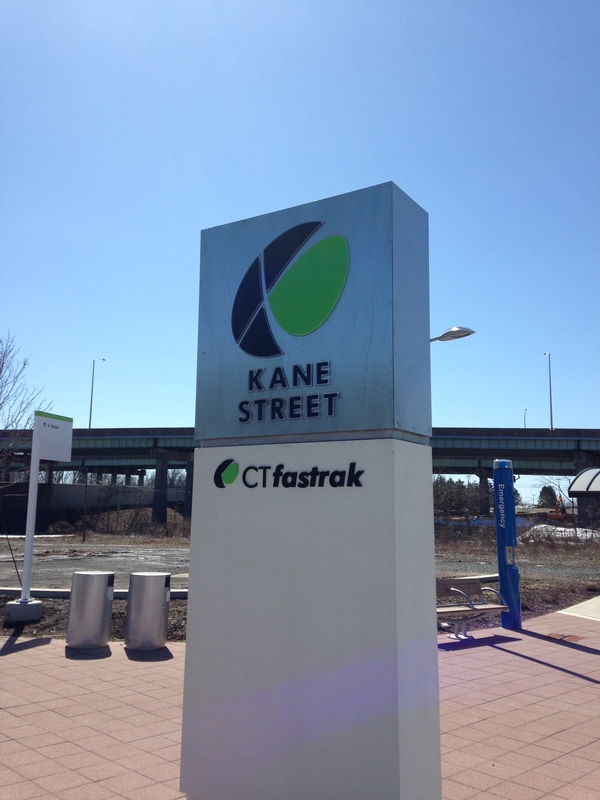 Use the word “free.” That is how CTFastrak got me, and plenty of others, aboard their buses this weekend. I wasn’t excited enough about it go walk around in the snow on Saturday, but the bright sunshine lured me out today. While Google Maps seems to think the Parrkville [sic] Station (or as I shall now refer to it, the Talk Like a Pirate Station) is closest to me, I chose to walk to the Kane Street Station. It isn’t a pretty walk, at least not one I would choose to do with any regularity. The most attractive portion is the convent, though the nuns don’t seem to forgive those who trespass. The station is still clean and new, with plenty of amenities. Plenty of benches if you get tired walking to the bus. Seven minutes till my chariot arrived. Once on board, it was, well, like riding a bus. I appreciate that the names of the stops are announced. When it snows, I take the bus downtown instead of biking, and I wish that feature were on the regular city buses. 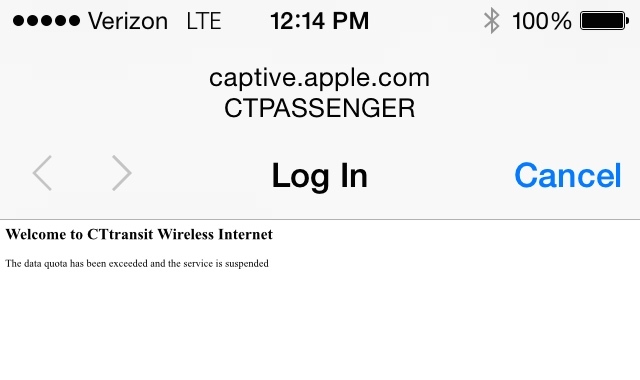 I had already read that the Fastrak wifi wasn’t working, but decided to try it anyway. a public library, and buildings that have changed use (I walked past a synagogue now housing a church). Yesterday my friends were Instagraming photos from Polish restaurants. My destination, though, was the New Britain Museum of American Art. Last summer, when I rode in the Mandell JCC’s Poker Bike Ride, I received a free Guest Pass to the museum (notice a theme here?). The NBMAA is pretty much the only reason I ever go to New Britain, and I don’t even go that often. Because I work two doors down from the Wadsworth Atheneum, I’m far more likely to go there for a cultural fix. It’s great having access to both, though. As soon as I saw Custer’s Gun by Otis Kaye, I thought it looked a lot like The Faithful Colt, which I often see at the Wadsworth. Yup, there’s a reason for that! “Custer’s Gun,” Otis Kaye, on view at the New Britain Museum of American Art. Museum label, New Britain Museum of American Art. My favorite piece of the day was this one, which I neglected to find the label for. 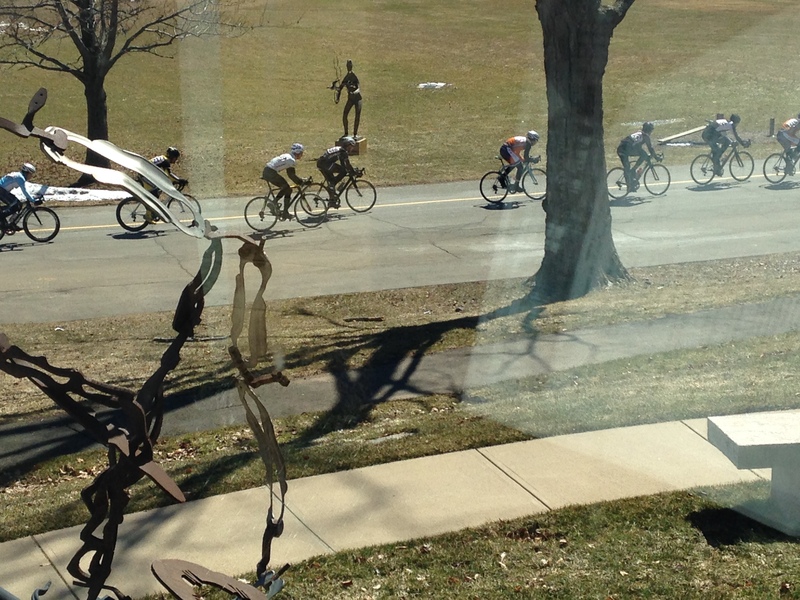 The best surprise, though, was the view of bicycle racing! The 2015 Ronde de Walnut Hill was taking place, and a friend of mine was even riding. Hardly the Tour de France, but much less jet lag. After saying hello to my friend, I made my way back to the station. The bus was overcrowded, and more than once the driver had trouble getting the rear door to close. But I made it back. I don’t foresee becoming a busway regular. For trips to downtown Hartford, it’s out of the way. And as I said, New Britain isn’t a big draw for me. When it warms up a bit, I would like to try the multiuse path that runs from Newington to New Britain. That’s more my speed.